SB Paving; Block Paving, Flags, Decorative Flags, Decorative Paving, Permeable Paving, Resin Bonded, Vehicle Crossings, Bricklaying, Drainage and Landscaping throughout Yorkshire. A full Garden Landscaping service. 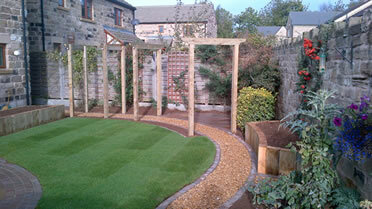 A full Garden Design service (in conjunction with MP Garden Design). Annual Maintenance of Block Paving (Jet wash & Re Sand). Fencing, decking, trellisses, etc. 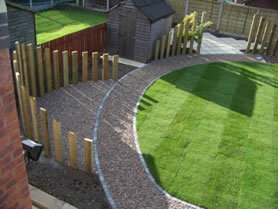 (in conjunction with Barkers Fencing, Pontefract). Turfing, Topsoil, Bark, etc, (in conjunction with Knottingley Turf). 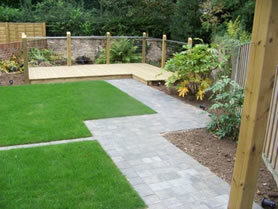 Our objective is always to ensure we can complete your whole garden project, whatever you require. Just contact us to find out more. SB Paving; Block Paving, Flags, Decorative Flags, Decorative Paving, Permeable Paving, Resin Bonded, Vehicle Crossings, Bricklaying, Drainage and Landscaping. Paving by Stoneflair, Bradstone, Tobermore, Plaspave and more. Serving customers in Pontefract, Castleford, Selby, Goole, Knottingley, Brotherton, Wetherby, Hemsworth, South Elmsall, South Kirkby, Wakefield, and surrounding towns. Website Design by Meadow Croft Consultants, Wakefield, Copyright © 2012.